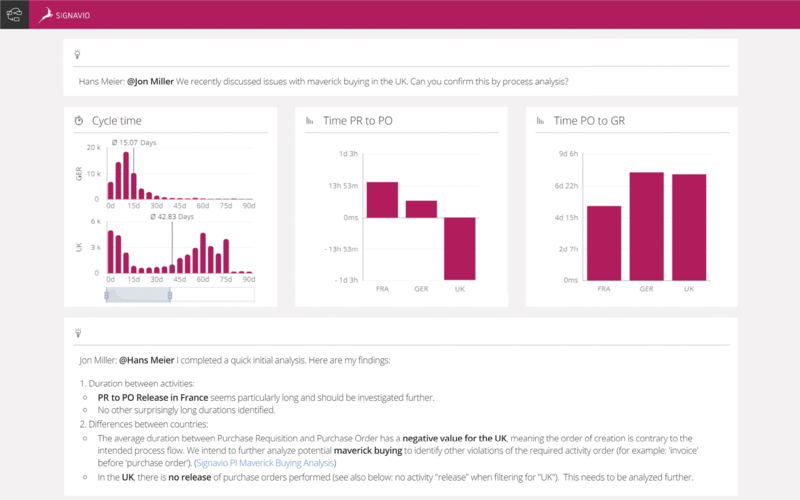 With Signavio Process Intelligence, you can make better decisions faster. Analyzing your system processes allows you to see the gaps and variants between the intended business process and what you actually have. Of course, the faster you discover what you have, the faster you can apply the changes that will make a difference in your business. Why are my processes not working like they should? How can I evaluate the vast amounts of data influencing my processes? How can I make process improvements across the board? 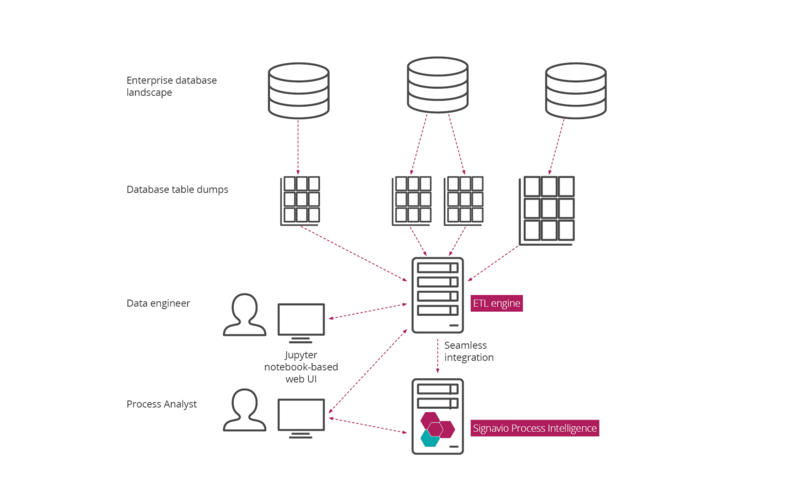 Signavio Process Intelligence enables you to automatically mine process models from the different IT systems operating within your business (also known as the “application landscape.”) Continuous monitoring of end to end processes provides insight into potential risks and ongoing improvement opportunities. 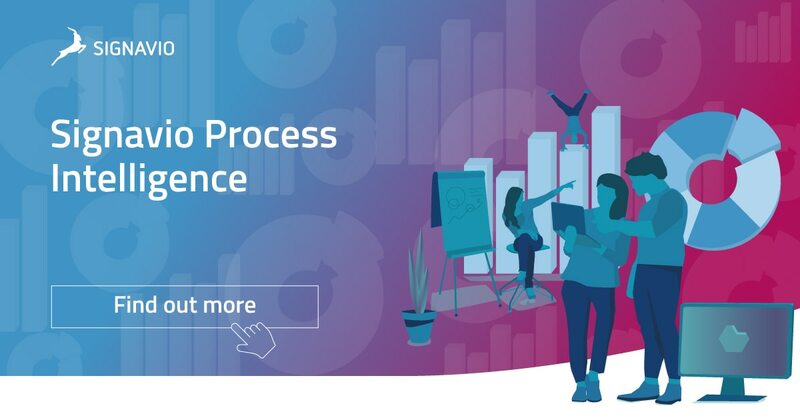 The powerful combination of process discovery, process analysis and conformance checking with a customizable ETL engine, all of which supports a collaborative approach to process improvement, will give you game-changing insights into your business. As part of Signavio Business Transformation Suite, Signavio Process Intelligence integrates perfectly with Signavio Process Manager and is accessible from the Signavio Collaboration Hub. As an entirely cloud-based process mining solution, the tool makes it easy to collaborate with colleagues from all over the world and harness the wisdom of the crowd to generate more ideas, optimize processes and reduce resistance to change. 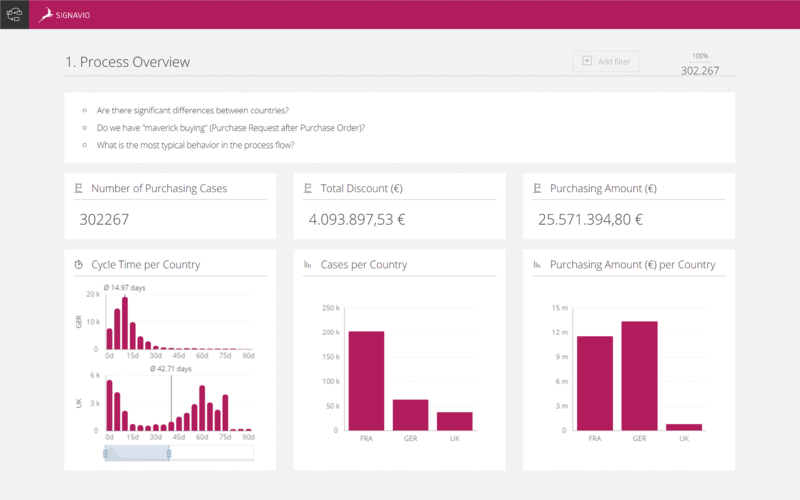 The Signavio Process Intelligence collaboration tool allows you to create shareable dashboards from an extensive set of visualization possibilities. The collaborative interface then guides you through the process of understanding how a process should work, how it runs in reality, and why and where deviations occur. Signavio Process Intelligence ships with an easily customizable ETL engine, allowing you to move your data within and between the various systems your business uses. 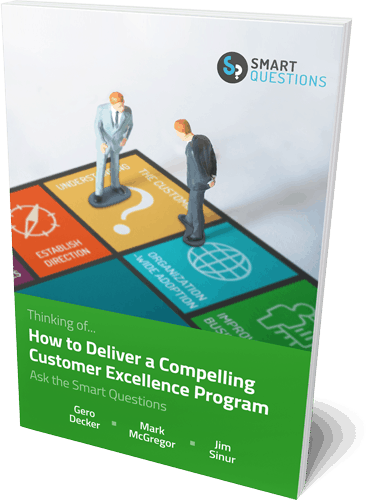 This approach enables you to connect processes that may seem isolated from each other, and build a clear picture of what is actually happening in your business. Signavio Conformance Analysis means you can now automatically check if a business process is actually running as intended, and whether the process is compliant with any internal and external restrictions or requirements. Easy-to-interpret visual representations show any deviations from the intended model, and highlight the impact of these deviations for the entire organization, using your own data. 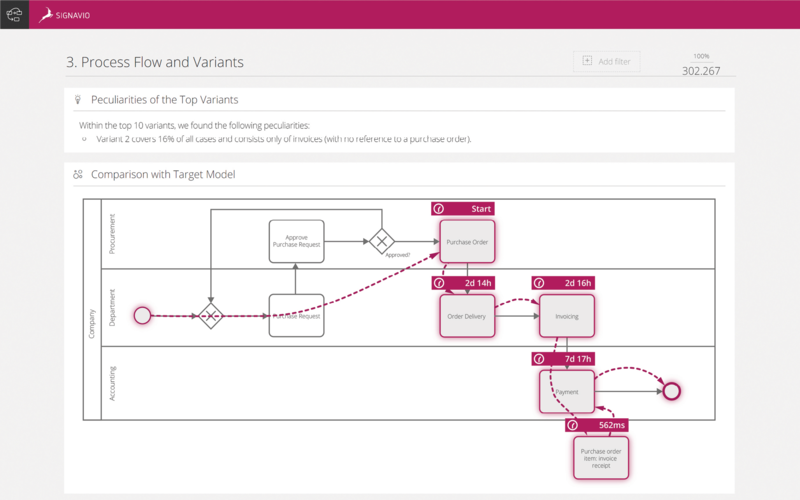 Signavio Process Intelligence creates process models from your IT event logs, meaning you have a real-time view of the “as implemented” system processes within your organization. The intuitive visualization component makes it easy to understand how many different paths through a process exist, and which one is used most. You can then drill down, take an in-depth look at specific process variants and derive actionable insights from your newly mined processes. The unique Signavio Process Intelligence investigative interface combines contextual storyboard-type reports with more traditional dashboard views. 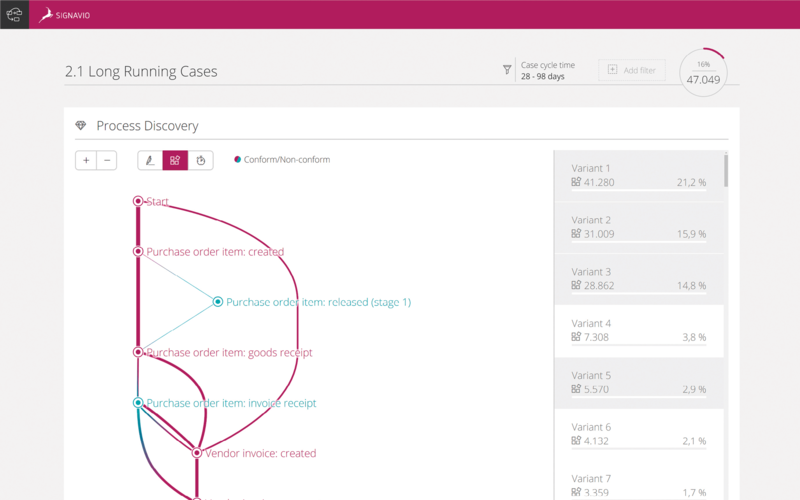 This allows you to analyze your processes and event logs in the context of your own ideas, giving you detailed information on each issue you want to investigate. In this way, the interface not only assists you to identify the issue, but also communicate it to others in an easy-to-read way, and find a solution.